Accounts Assistant/Junior Assistant, Lab Technician and Dresser jobs. Candidates who are having the necessary qualifications they can submit their application form online only for this DHS Assam Accounts Assistant/Junior Assistant and other posts. Last date for online applications for this DHS Assam recruitment of Pharmacist, Accounts Assistant, Lab Technician and other jobs is 14-03-2018. Online applications are accepted through www.dhs.assam.gov.in website only from 05-03-2018 for this DHS Assam recruitment 2018. 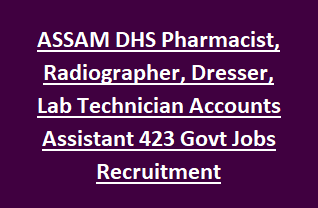 Selection for this DHS Assam Pharmacist Radiographer Dresser Accounts Assistant jobs Recruitment is through written test or based on merit in educational qualifications. More information about this Assam DHS Pharmacist, Lab Technician, Accounts Assistant and other jobs vacancy details, selection process, age limits are given below. For district wise vacancies refer official notification. Age limits as 01-January-2018 is 18-43 years. 5 Years of upper age relaxation will be given for SC/ST candidates. Pharmacist Jobs-D.Pharmacy or B.Pharmacy qualification required and registration with Assam pharmacy Council. Lab Technician-Lab Technician Certificate course qualification required. Selection will be through Written test or based on educational qualifications merit. Candidates must have produce the original documents at the time documents verifications. Fee pay under Treasury Chalan" 0210-M&PH-01-Urban Health Services-800-Other Receipt". Candidates who are willing to work in newly constructed Model Hospitals they can apply online for this vacancies from 05-03-2018 to 14-03-2018. It is mandatory for submission of application form online. Offline mode of applications will not considered. Online applications for this DHS Assam Jobs will be accepted through www.dhs.assam.gov.in.